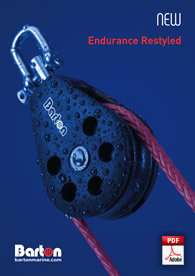 Boat size listings are designed to help you choose the right size of Boomstrut for your craft. But this is a guide only as boom length, boom and sail weight may vary. We recommend, after reading the instructions fully, that if the rods require cutting you should install the complete system. This would mean the boom position would not be correct but will allow you measure the downward force (with sail flaked) on the aft end of the boom to flex the rods. The correct downward force would be approx 5kg. If larger/smaller force is required we recommend contacting your dealer so the rods can be exchanged for the correct size diameter to suit your craft. Rods which have been shortened will not be exchanged. Screwdriver, Fine Tooth Hacksaw, Centre Punch, Ruler, Reversible Variable Speed Drill, Drill Bit 5 mm, M6 Coarse Tap and Pencil. Use the main halyard to support the boom above its highest operating position. This would usually be between 15cm (6") and 30cm (12") above the horizontal at the outboard end (see fig. 1). Note: If the boom accidentally lifts approx, 25cm (10") above this height, the Boomstrut will simply slide out of the boom fitting. To override this safety feature, restrict vang (kicking strap) travel with a knot or by adjusting the length of a cascade. 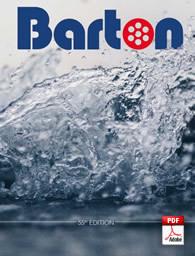 At this time, check that the model 44030 is correct for your boat. The minimum operable length is 88cm (35") pin to pin and the maximum weight it can support is approx. 15Kg (34lbs) measured at the end of the boom with the sail flaked. 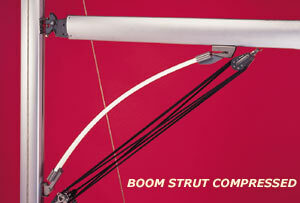 The Boomstrut works by flexing upwards and when straight, it is at the top of its travel. Install the Boomstrut with the screw head side of the rod clamps facing upward. With the boom height set as above and the mast and boom fittings attached to the Boomstrut, position it alongside the vang triangle to see how it fits. Position is not critical so long as it does not interfere with the vang (kicking strap). 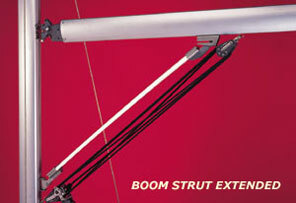 It is recommended that both the vang and Boomstrut make an angle of between 30 and 40 degrees with the boom. 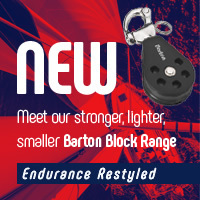 The Boomstrut is designed to fit inside your current vang (kicking strap) tackle, but in some cases it may be necessary to reposition attachment points of these blocks to allow sufficient room. At this point mark the location for the mast fitting. 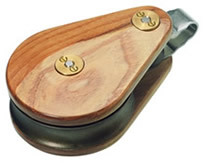 The mast fitting (see fig 2) comes with a luff groove slide to avoid drilling into the mast. This should be slid into the sail opening on the mast and slid down to the required position as previously marked. Tighten the clamp screws to secure. If the slide does not suit your mast section, it will be necessary to screw the stainless steel mast bracket directly to the mast. Using the mast bracket as a template, mark, centrepunch, then drill and tap the first hole. Screw the bracket then mark and centrepunch the second hole. Remove the bracket, drill and tap the second hole then fit the bracket permanently. It is advisable to use some sealant in the screw threads to prevent corrosion. Use a 5 mm drill and an M6 coarse tap to complete this task. A variable speed reversible drill makes tapping the holes easy. If the Boomstrut is too long, take the following steps to ascertain correct length and shorten rods. Loosen the rod clamps at the mast end and slide rods through the clamps until the desired length is achieved. Mark both rods accurately then cut to length with a fine-toothed hacksaw. Refit the rods into the clamps ensuring that they are up against the embossed stops to prevent slipping. Ensure that the unit is parallel and not twisted relative to each end, then tighten clamps with the Allen Key. IMPORTANT: Do not shorten the total lengths of the rods by more than 150mm. Ensure that the rod clamps are tight at both ends. With the Boomstrut in position and slid to the back of the slot in the boom fitting (see fig 3), mark the location of the boom fitting on the boom. Using the fitting as a template, mark, centrepunch, drill and tap the first hole. Attach the boom fitting then mark and centrepunch remaining holes. Remove the boom fitting then drill and tap these holes. The boom fitting is now ready to install using sealant in screw threads to avoid corrosion. Use a 5.0 mm drill bit and an M6 coarse tap to complete this task. A variable speed reversible drill makes tapping the holes easy. After installation, check the return force by pushing down on the end of the boom. Excessive return force will cause the boom to bow. For reference, with the sail flaked, only approx. 4.5kg (10lb) should be needed to pull the end of the boom down. Should you have any questions with regard to installation of your Boomstrut please contact your Chandler in the first instance.